Welcome to Classic Glass at GlassBlowingArt.com! The name should say it all! Everyone has most likely heard the term glassblowing used before and think they know it's definition. Most people generally assume “glassblowing” is used to describe the art of crafting vessels and sculptures from a furnace filled with molten glass. You might picture a glassblower using long metal blowpipes and special tools; made from wood, brass and iron, to form the infinite shapes we’re all familiar with when we think of blown glass. Yes this is a typical definition, but now it has evolved to include much more. Around the 15th century; there was a strong rising interest in the sciences of chemistry. Over time laboratory apparatus's were invented with the help of glassblowing. This is the era when the definition of glassblowing expanded to describe the term “Lampworking”. In order to make the precise instruments needed for science, the glassblower would need to find a way to form the hot glass into the many test tubes, beakers, and other specifically shaped items a laboratory would use. A glassblower began by making glass tubes and rods from a furnace. They would then use an specially designed oil lamp to manipulate the glass, hence the name “Lampworker”. It is truly amazing that a simple oil lamp would continue to create enough heat to melt glass once it had been out of the furnace! This was found possible by blowing a concentrated stream of air across the oil lamp's flame. By adding oxygen it made the flame much hotter. To add oxygen efficiently, glassblowers would use an air bellow; powered by a foot peddle or sometimes just a tube from their mouth, to make this air stream for the flame. These blowing techniques were perfected over time and used to craft the laboratory apparatus's and later novelty items such as buttons, small figurines, and menageries all from the tubing and rod produced by the furnace glassblowers. The term “lampworking” has since been antiquated and replaced by more modern term of “Flameworking”. It's definition lends to the techniques of forming objects by the means of melting rods, tubing, and sheet-glass using a torch. Creating glass sculptures has evolved into an ever changing art/science! Every day, with a newly created color of glass, or it's new techniques and new high tech equipment, it lends the way to infinite possibilities! 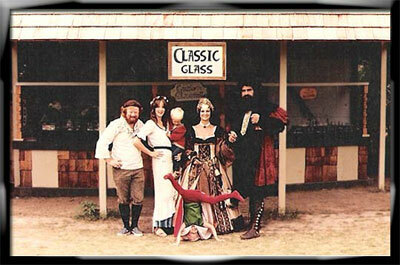 Classic Glass was established in 1979 by Zachary and Toni Rowan. Our start was in Central City, Colorado. It is a famous gold mining town from the Victorian era of the 1860’s, transformed in modern times to a robust vacation destination filled with tourist shops, museums and saloons with live music and festivals. In 1976 we both got jobs at the local glassblowing shop as associates for sales and production. After many years of faithful service, we left to create our own special glassblowing business. With just a limited number of artwork designs, we still felt we were on our way to a successful blooming glass art business. With a lot of confidence in our art we left for the open road of crafts and art shows. 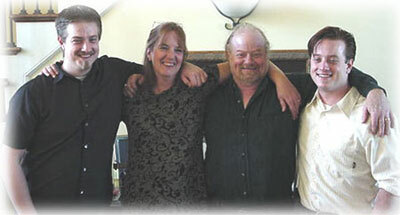 When we started our business, we had our first son who was three years old when a second son was due in 1981. The road turned out to be a little too rocky to start a new business and a family. There was the reality of bad shows, car trouble, and little money to inspire and allow us to create more glass art. We went back to Missouri, got a regular job, a new home in the city, and had our second healthy son. Yet for some reason our minds screamed “NOT ENOUGH”! Glass, fire, ideas yet accomplished, the passion of the flame consumed our life. We had to keep trying. Every spare moment from our mundane life was put back into glass. We kept practicing what we had learned working in Central City. We kept making roses and flowers over and over again until they looked better than ever. When I started blowing glass, the horses looked like dogs, so I spent a month blowing glass horses until they looked just right. Even the hummingbirds looked like mosquitoes until we got it right. We tried every sort of animal we could think of. We kept practicing everything until we got it right. Finally we had perfected enough sculptures to be proud of and tried doing more art shows. We rented a cart at the Crown Center mall in downtown Kansas City. It finally started to work for us. We sold every thing we could make. People stopped saying “Is that suppose to be a horse, or a unicorn, or an eagle...etc?” like they would ask us at earlier shows. Finally we could produce good realistic forms to be recognized as art. Our journey into the glass art world, had resumed! Arts and craft shows were good to us. We started to make a living. With every show we did our work became better. Then we met another crafts person who told us about the RENAISSANCE FESTIVAL. Renaissance Festivals? A recreation of a 15th century English village? What kind of place was it? It is a place where an artist could make whatever they wish and sell it to the people. It was an inspiring mixture of artists from every media. With everything from entertainers and comedians, to Shakespeare and jousters on horseback, there was medieval structures surrounded by exciting passionate people. These folk devoted their lives to the festivals, we decided to devote our live to this wonderful new world. Where else could we make things like dragons, unicorns, fairies, and fantastic creatures of our own ideas. The sky was the limit. Anything goes and it did. 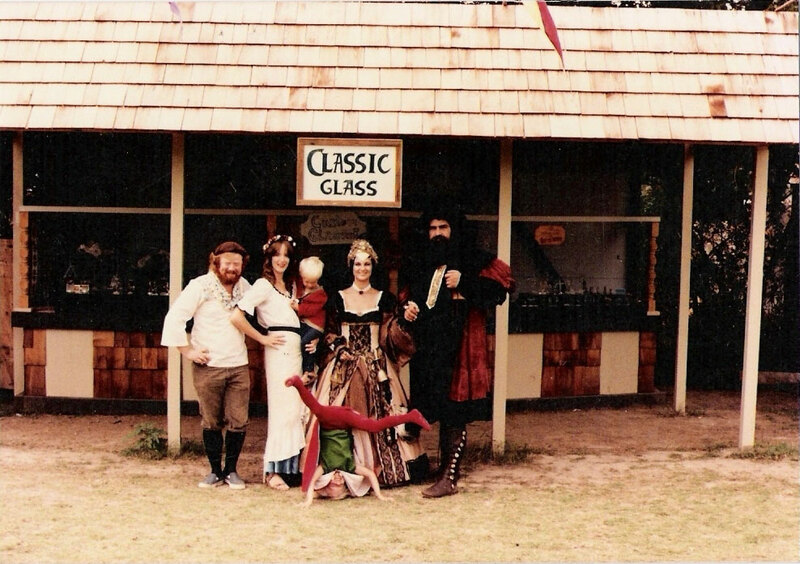 That was 1981, the beginning of our long and wonderful world of renaissance festivals. 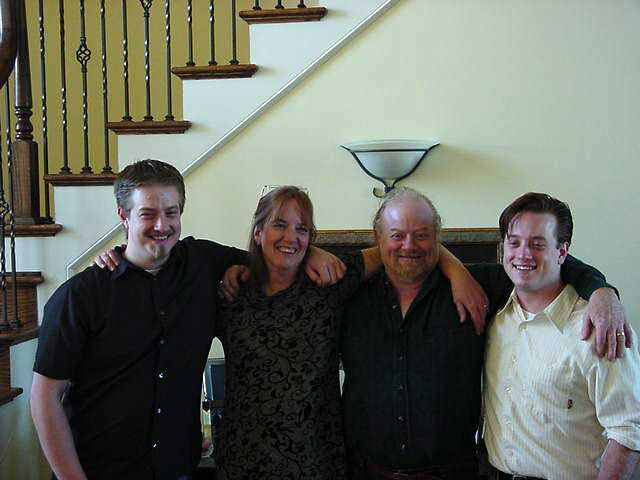 Since that beginning we prospered well enough to raise our two sons to adult age. We still work the renaissance festivals after all these years to this day. They are forever ingrained in our inspiration, love and passion in our artwork. Our home (since 1984) is in the Beautiful “Lake of the Ozarks” in central Missouri. Our artwork is done in our studio, then taken on the road to various Renaissance Fairs, state fairs, craft shows and anywhere that will have us. Our website opens the entire world to our world of glass art. We love to talk to anyone about our art, glass in any form, art in any media for all that goes. We welcome all new friends. Feel free to contact us for anything, especially glass art. We love custom orders, let us try to create your visions wants and desires. No job is to small or too large. You are the most important people to us. This animation is made (for fun) from a still photo of Zak working on a glass knight master piece. This is a small clip captured from our video camera of Toni working on a glass long stem rose.